Robert Tripolino (Jesus) recently played Sal Russo in RAGS (Hope Mill, Manchester). Originally from Australia, theatre credits include: Omar in Disney’s Aladdin (Australian Tour), Chino in West Side Story (State Theatre, Arts Centre Melbourne), Jean-Michel in La Cage Aux Folles (The Playhouse, Arts Centre Melbourne), The Addams Family (Capitol Theatre, Sydney) and A Funny Thing Happened on the Way to the Forum (Her Majesty’s, Melbourne). As a composer, credits include Dreamsong (Melbourne International Comedy Festival), Death Suits You (Melbourne Cabaret Festival) and Guilty Pleasures (Australian Tour). Ricardo Afonso (Judas) previously appeared as the Taxi Driver in Women On The Verge Of A Nervous Breakdown (Playhouse), as Alberto Beddini in Top Hat (Aldwych/UK Tour), Lead Vocalist in Thriller Live (Lyric), Galileo in We Will Rock You (Dominion), and as a lead vocalist in The Classic Rock Show (European/UK Tour), The Wonderful World of Captain Beaky and His Band (Royal Albert Hall) and Strictly Come Dancing – The Professionals (UK Tour). Angolan born Ricardo appeared on The Voice UK series 2, and is a recording artist working in the UK and in Portugal. He is currently recording his first original album with his band The Deccan Traps. Cavin Cornwall (Caiaphas) originated the role of Caiaphas in the Regent’s Park Open Air Theatre production of Jesus Christ Superstar, reprising the role at the Lyric Opera of Chicago in 2018. He previously played Caiaphas on the UK arena tour of Jesus Christ Superstar having originally played Peter in the 1999 film version (Really Useful Films). He is currently appearing in Rip It Up (Garrick). Other theatre credits include: Disney’s Aladdin (Prince Edward), The Color Purple (Cadogan Hall), Sister Act (UK Tour), Billy Flynn in Chicago (Adelphi) and Crown in Porgy and Bess (Savoy). On film credits include, for the Star Wars franchise: Han Solo A Smuggler’s Trade, Star Wars VII The Force Awakens and The Last Jedi. Also Paddington 2, and Les Misérables. Nathan Amzi (Annas) most recently appeared in Heathers (Theatre Royal Haymarket). Other theatre credits include: Henry V (New Generation Festival, Florence), One Flew Over The Cuckoo’s Nest (Sheffield Crucible), Prom Queen (The Other Palace), Disney’s Aladdin (Prince Edward), Dinner With Saddam (Menier), In The Heights (Southwark Playhouse) and Urinetown (Apollo). Film and television credits include: The Voice UK Series 3, London Road, Informer (BBC), Sick of It (Sky One), Absentia and Good Omens. 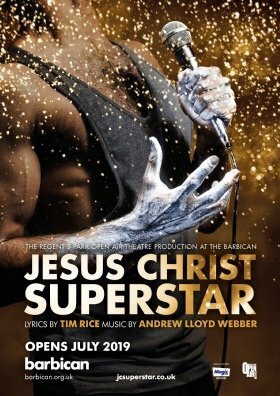 Jesus Christ Superstar is directed by Timothy Sheader, with design by Tom Scutt, choreography by Drew McOnie, musical supervision by Tom Deering, lighting design by Lee Curran, sound design by Nick Lidster for Autograph, musical direction by Ed Bussey and fight direction by Kate Waters. Barbara Houseman is Associate Director, Voice and Text, and casting is by Will Burton CDG and David Grindrod CDG. As Artistic Director of The Jamie Lloyd Company, Jamie Lloyd (Director) is currently producing and directing Betrayal and Pinter at the Pinter, a season of Harold Pinter’s short plays in the West End. Theatre highlights include: Doctor Faustus (Duke of York’s); The Maids, The Homecoming, The Ruling Class, Richard III, The Pride, The Hothouse, Macbeth (Olivier Award-nominated, Best Revival), Apologia (Trafalgar Studios); Guards at the Taj (Bush); Assassins (Evening Standard Award nomination, Best Director; Menier); Urinetown (St James Theatre/Apollo); She Stoops to Conquer (WhatsOnStage Award nomination for Best Revival; National Theatre); The Pride (Olivier Award Winner, Outstanding Achievement in Affiliate Theatre; Royal Court); Passion (Evening Standard Award Winner, Best Musical; Donmar Warehouse) and Piaf (Olivier Award-nomination, Best Musical Revival; Donmar Warehouse/Vaudeville/Teatro Liceo, Buenos Aires/Nuevo Teatro Alcala, Madrid). Soutra Gilmour (Designer) designed The Turn of the Screw for Regent’s Park in 2018, as well as Into The Woods, which subsequently played in Central Park, New York for the Public Theater. Recent theatre credits include: Betrayal and Pinter at the Pinter (Harold Pinter), Jack the Ripper (ENO), Timon of Athens (RSC), Knives in Hens (Donmar Warehouse) and Twelfth Night (National Theatre). Alan Williams (Musical Supervisor) has worked as Musical Supervisor/Arranger on productions including: Funny Girl (Savoy/UK Tour), Urinetown (Apollo), The Commitments (Palace/UK Tour) and Shrek (UK Tour). As Musical Director credits include: Aladdin (Prince Edward), Funny Girl, Assassins (Menier), A Damsel in Distress (Chichester Festival) and A Chorus Line (Palladium). Jon Clark (Lighting Designer) recently won the Olivier Award for Best Lighting Design for The Inheritance. For Regent’s Park previous credits include The Turn of the Screw and Into the Woods. Other recent credits include: Betrayal and Pinter at the Pinter (Harold Pinter), Alys Always (Bridge), The Lehman Trilogy (National Theatre), The Jungle (Young Vic) and King Charles III (Olivier nomination, also Broadway, Sydney and UK Tour). Recent opera credits include: The Exterminating Angel (Metropolitan Opera, Royal Opera House, Salzburg Festival, Royal Danish Opera). Nick Lidster (Sound Designer) is a senior member of the Autograph design team. Previously for Regent’s Park, credits include Little Shop of Horrors, The Turn of the Screw, On The Town and Jesus Christ Superstar (Olivier Award Best Sound Design nomination, also at the Lyric Opera of Chicago). Current projects include: The Band (Theatre Royal Haymarket/UK Tour) and Calendar Girls the Musical (UK Tour). Barbara Houseman (Season Associate Director, Voice and Text) has been Voice and Text Coach at Regent’s Park since 2019, and Season Associate Director since 2014. Recent credits include: Strictly Ballroom (Piccadilly), The Ferryman (Gielgud), Rosencrantz & Guildenstern are Dead (Old Vic), The Curious Incident of the Dog in the Night-Time (Gielgud/Tour), St Joan, All Female Trilogy, Les Liaisons Dangereuses, Coriolanus, Trelawny of the Wells (Donmar Warehouse) and the Kenneth Branagh Season (Garrick). The 2019 season at Regent’s Park Open Air Theatre also includes productions of Our Town, Thornton Wilder’s Pulitzer Prize-winning play (16 May – 8 June), the opera Hansel and Gretel (14 – 22 June) in a co-production with English National Opera, and Shakespeare’s A Midsummer Night’s Dream (28 June – 27 July).